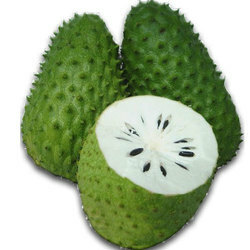 Cancer treatment fruit graviola commonly known as guyabano or soursop is now available at your doorstep. It is a natural remedy for Cancer it is also known as "Cancer Killing Fruit". To meet the various requirements of the customers, we are involved in offering a wide assortment of Graviola Leaves. We are Tapovan Herbs unit of All India tapovan institute of pharma a Under Sec. 25 Co. We are into herbal products Like Soursop and Natural Insulin, Our 300 acre of farms are situated in Madurai. We are a top notch supplier of Soursop Leaves. Packaging Type: PE 1 kg PE OR Aluminium bag. Happy to help paitents best quality available, kindly contact us for more details. We are a top-notch organization, engaged in providing Soursop Leaves. We are a top notch supplier of Soursop Graviola leaves. Banking on our enriched industry experience, we are able to supply Soursop Leaves. The leaves of soursop plant are believed to have analgesic properties which can relieve pain. Their juice is effective in healing the wound while relieving pain from injury.